First-team coach Mark Pulling believes Lancing Football Club have the capabilities to realise their Bostik League ambition over the next few years. The 39-year-old former Worthing, Eastbourne Town and Burgess Hill player will be part of returning manager Ash Bailey’s backroom staff for the upcoming Southern Combination League Premier Division campaign. Bailey is back following John Sharman’s departure at the end of last season and is looking to build from where things ended in his last spell. In Bailey’s only previous full season in charge – 2015/16 – he guided Lancers to a fourth-placed SCFL Premier Division finish while also ending the club’s 26-year wait for silverware as they won the Peter Bentley Cup. Pulling, who worked with Bailey during his spell at Ringmer, is also set to be available to play this season. He said: “Pre-season has gone as well as it could have done, everyone is just looking to get started now. “We’ve managed to recruit well and the aim is to improve on the club’s finishes over the past couple of seasons. “The project was one that really excited me so I had no hesitation in coming here with Ash. I’ve felt quite good in pre-season and am looking to play when I can this season. But the thing that most excites me is the coaching side of things. 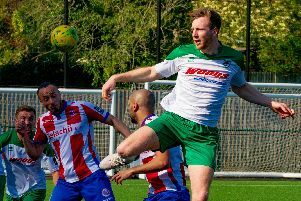 Bailey has recruited a number of players with Bostik League experience as he looks to finish as high up the table as possible in his first season back. Matt Daniel, Jack Rowe-Hurst and Brad Tighe all played under Bailey at Ringmer and have moved to Culver Road for the forthcoming campaign. Exciting pair Alex Saunders and Connah Gardener-Lowe are others to have bolstered Lancers’ playing options. At this stage it looks as though everyone Bailey and Pulling wanted to remain will do so. First-team coach Pulling added: “The main targets we had at the start of the summer have joined and it looks as though we’ll keep hold of everyone we wanted to remain, so it’s been a good pre-season. Bailey’s first competitive game since returning is at Loxwood in the league on Saturday before they face a tricky trip to Pagham three days later. A tough game at Bostik League South East new boys Haywards Heath Town in the FA Cup extra preliminary round then follows.